256 pages | 15 Color Illus. | 9 B/W Illus. Adenoviruses are double stranded DNA viruses that have been used to study the process of DNA replication. Studies of the mode of action of adenovirally produced tumors in rodents led to the discovery of tumour supressor genes. The adenoviral vector is now the most used vector in clinical gene therapy especially for some kinds of cancers. 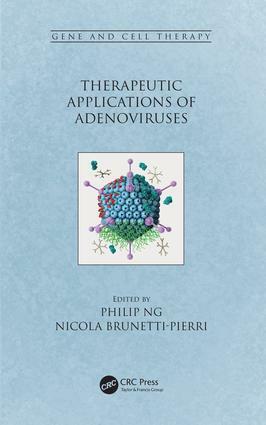 The chapters in this book focus on the most up-to-date developments in the therapeutic applications of adenoviruses. The intended audience is individuals in the Life Sciences interested in therapeutic applications of adenoviruses. This book reviews the life history and immune responses to adenoviruses and summarizes various therapies implemented with the use of adenoviruses. Adenovirus Biology and Development as a Gene Delivery Vector. Innate and adaptive immune responses to adenovirus. Svetlana Atasheva and Dmitry M. Shayakhmetov. Helper-dependent adenoviral vectors for cell and gene therapy. Chemical and combined genetic and chemical modifications of adenovirus vector capsids to overcome barriers for in vivo vector delivery. Design and applications of adenovirus-based hybrid vectors. Adenovirus vectors for genome editing involving engineered endonucleases. Use of oncolytic adenoviruses for cancer therapy.